PsychLab software integrates your laboratory. One program receives data from amplifiers, including third party equipment, organises stimulation procedures, plays sounds, and shows pictures or movie files on a separate monitor, positioned near the subject. Additionally it can record live video stream from one or more cameras, sychronized with physiology. 'External' events, such as tasks on another computer, are electronically registered. Psychlab acquire automatically synchronizes any number of PsychLab amplifiers and stimulators via standard USB cables. Minimum resolution is 16 bit. A separate program designed for specific analysis and reduction of physiology wave-forms also allows sychronized viewing of recorded video with off-line physiology encoding capability. A macro facility allows complex analyses to be automated. Default acquisition mode is continuous; sample rate and other acquisition properties are user selectable. Data export is provided in various formats. PsychLab supports PCC stimulus script files, which have been used with our software for many years. These scripts provide a list of mnemonics that may be used to control the various stimulator devices, control timing, and so on. This method of stimulus control allows complete flexibility in experiment design, and is ideally suited to research. Our engineers create the required scripts to provide turn-key solutions for your experiments, allowing you the flexibility to later edit them as required. Unlimited e-mail assistance is provided to all customers. Programs such as Superlab, E-prime, Matlab and so on may be directly linked into the PsychLab event registration system for precision timing of picture delivery etc. 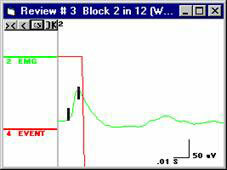 PsychLab software also provides a system for picture presentation within the acquisition program. 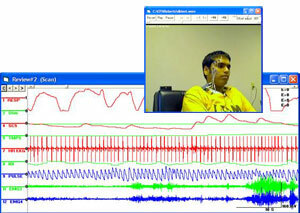 Multi-media computer systems have a lot to offer modern Psychophysiology. Huge hard drive capacity and high speed internet allow almost unlimited storage and ease of movement of raw data and programs. 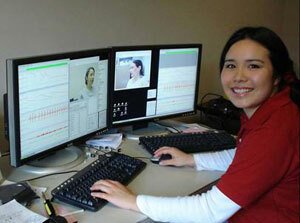 Video and sound recording facility makes it practical to monitor the subject by video in addition to measuring physiology. It is possible to capture synchronized video images from one or two cameras directly onto computer disk while simultaneously recording physiology on the same computer. Inexpensive web-cameras, or professional devices like the high resolution tracking camera shown, may be used. Video with sound may also be used for stimulus purposes. The analysis program uses a series of windows ‘Reviews' to graphically depict each analysis stage. Each Review window shows data from all devices that were recorded, synchronized together. Facility is provided to modify the event channel manually for the purpose of encoding the record, from manual notes that may have been made or while observing the recorded video image. The analysis tools are designed to work with data in blocks of fixed time period. 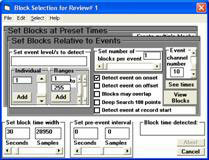 Blocks may be created on the basis of events that are detected in the event channel, or at fixed times. The block settings panel is used to define how blocks should be made. A ‘MultiBlock Review is then shown, depicting all the blocks. A variety of algorithms may then be applied to each block in turn. Wave detection: Ability to identify and quantify responses such as SCR, startle blinks, EKG R wave, etc. Mean: Find average value, minimum, maximum, standard deviation and absolute deviation of data within block. Average: Perform signal averaging on blocks, as in averaged evoked potentials. manipulate data found in each point for each channel in each block. Rectify: Convert all negative parts of bipolar signal to positive. All stages of an analysis may recorded and then be automated. Additionally intelligent script allows the format of result data to be controlled with great flexibility so that result data will fit for subsequent analysis in spread sheet or statistical software. Results are normally produced as numerical data normally organized in rows representing the different numerical fields, for example trial number, subject number, physiological parameter 1, parameter 2, etc. ocar aquí el contenido para id "pie"